The Indira Gandhi Conservation Monitoring Centre (IGCMC) was established in 1994 as a programme area within WWF-India with support from the Ministry and Environment and Forests (MoEF).IGCMC, set up as a national facility, supports biodiversity and natural resource conservation in India through the collection, management, and accessibility of relevant data and knowledge. For this purpose, IGCMC uses geographic information system (GIS) and remote sensing techniques to procure data to facilitate WWF-India's work in the field of conservation. Mehao Wildlife Sanctuary in Arunachal Pradesh. The increasing demand for GIS services implies that IGCMC needs to continuously seek new capacity and add value to its services. This requires generating resources for fresh investment in infrastructure and manpower based on service demand projection. IGCMC faces several internal and external challenges in keeping pace with the rapidly changing technological and institutional landscape of GIS. At the external level, there is a need to make new investments to upgrade to the latest technological systems such as capabilities towards hyper-spectral image analysis, radar data analysis and capacity for advanced statistical analysis. Internally, there is a challenge to recruit and retain quality manpower in the face of rising costs. The geographic scope of IGCMC spans the whole of India but for practical purposes the focus of the Centre remains field-based programmes like Species and Landscape, High Altitude Wetlands (HAWs), and Rivers Basins and Water Policy. 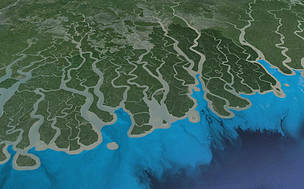 In the past, IGCMC provided GIS inputs for critical regions like the mapping of the tiger corridor in Satpura-Pench in the Satpura Maikal Landscape (SML), Kaziranga and Kaziranga-Karbi Anglong Landscape (KKL) in the north-east and the Kosi river corridor for mapping the Terai Arc Landscape (TAL). For thematic areas, IGCMC supports programmes related to biodiversity, climate change and sustainable livelihoods.